About a month ago, I attended a Central Market cooking class taught by remarkable baker and teacher Nick Malgieri. For this class, he prepared sweet and savory pastries from his new book The Modern Baker . This book provides time-saving techniques for all types of baking. Throughout the class, Malgieri’s vast experience was evident as he demonstrated multiple ways to complete several tasks. One technique he explained was taking the base out of a removable bottom tart pan and rolling pastry right on it. That way, you know exactly when you have rolled it to the proper size. He also demonstrated his general technique for rolling pastry and making quarter turns between rolls to arrive at a perfect circle. Both demonstrations took him about two and a half minutes total and couldn’t have appeared any easier. He also had great insight about baking times and temperatures. His preference is for well-done, flaky, and crisp tart and pie crusts. He mentioned that he sometimes bakes them directly on the floor of an oven to achieve such a crust. Interesting. One of the savory items he prepared that night was this paprika palmier. Now I have to mention a detail that stuck in my craw. Malgieri prepared and included in the book a recipe for instant puff pastry. 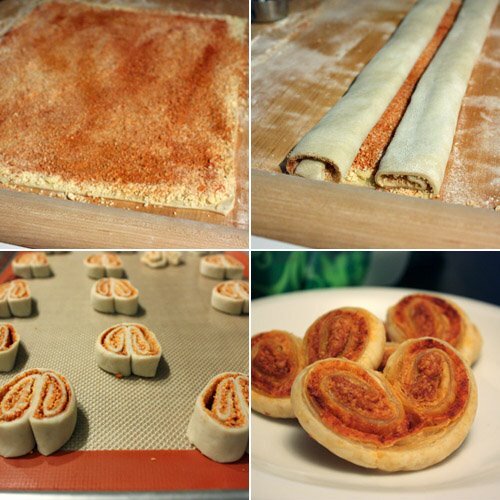 This pastry was prepared in a food processor and was then rolled and folded. For me, it was not puff pastry. This is what he used for these palmiers, and the sample was delicious, and he did point out that the pastry would not achieve the volume of a true puff pastry. So, maybe if it were called quick pastry that tastes good but isn’t quite like puff pastry, then I would have accepted it and moved on. 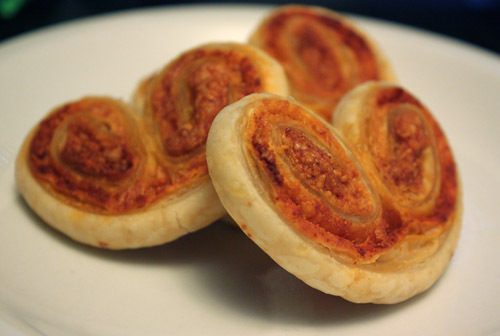 For a palmier, savory or sweet, I wanted the pastry to be of the real puff variety. That’s why I chose purchased puff pastry to prepare this quick hors d’oeuvre for a holiday party this past weekend. Great news: Whole Foods now makes their own brand of all-butter puff pastry, and it’s found in the freezer section. These little gems came together incredibly simply. Roll out pastry. Brush an egg wash over entire surface. Sprinkle on grated parmigiana reggiano, smoked Spanish paprika, and sea salt. Roll, chill, cut, and bake. Smoky, nutty, salty, and buttery flavors melded into lovely, little cocktail snacks. I’d love to attempt making my own pate feuilletee, but the pre-made all-butter version is a great alternative. I’ve flipped through The Modern Baker , and every recipe in it looks like a winner. There are a few cookies from it that are already on my Christmas baking list and several tarts and cakes that I look forward to trying too. Let's get into sync with me again, food sista'. You took a class with Nick Malgieri? my all time favorite baker. I made his PANFORTE this weekend! Email your weekly menu, so we are on the same page!!! So interesting. They are really pretty indeed. The parm probably makes them pop as well. Not fair! You are so lucky you got to take a class with Nick Malgieri! These look just beautiful, so you obviously learned a lot. Do you like his new book? How delicious! I was just searching for a way to use up the last of my puff pastry dough. This looks perfect!!! This SINGS holiday! Looks great. I love this idea so much! This is coincidental... I was frantically looking for an app recipe that would utilize puff pastry for which I would have all of the ingreds. in my house. This would have been a perfect recipe to try. Saw it too late... I went with something else. I'll definitely save this one for another time. Looks easy and good! That is beautiful stuff. This beats any of the plain palmiers I've had before. Woww that sounds cool. Central Market is my favorite market and I always get these cooking classes schedules but never attended any. Always wondered how good they were. Anyway, these paprika palmiers look very very good. Great for parties! Lovely that you made them from scratch - I make these for nibbles (with pesto inside) for nibbles with drinks when I'm in a rush but I'm sure they taste far better when you make them yourself.